Hamsters are mammals, and belong to the rodent family. They have large incisor teeth that are continually growing and they must gnaw to prevent the teeth from overgrowing. The word 'rodent' is derived from the Latin word 'rodere' which means 'to gnaw'. There are many different species of hamsters throughout the world and most inhabit semi-desert areas where they live in burrows. These burrows consist of many tunnels and separate chambers to store food or sleep. Hamsters are nocturnal, sleeping during the hot days and waking in the cooler evenings. They have very poor eyesight but a keen sense of smell and excellent hearing. Most species of hamsters have expandable cheek pouches in which they can carry food and bedding back to their burrow where they will store food. The word hamster' comes from the German word 'hamstern' which means 'to hoard'. How long does a hamster live? The average life span of a Hamster is 2.5 years, but with good care they can live longer. What kind of cage do I need? Don't use a round cage, or a cage with a wire bottom! There are many different types/brands of cages out there. Fish tanks and wire cages with a solid bottom are the two most common solutions. It's not a good idea to have a wired base. (It can hurt their little feet and it is hard to clean) The size of the cage is important. Your hamster needs enough room to exercise in. (Make sure it's large enough for a big wheel.) Naturally the bigger the better. It depends how much you can afford. Never get a round cage; they are being sold in various pet shop, the reason being that your hamster needs all four corners otherwise they lose orientation and go crazy. The spacing of the bars are also important make sure they are not more that ½ inch apart. Hamsters are masters of squeezing through bars if not the right size. What Items and accessories do I need to buy? House - Hamsters need a hiding place where they can sleep and feel safe. This can also can be a little cardboard box. Do not use the fluffy bedding that is sold in pet shops. There have been cases where hamsters have tried to stuff the fluffy bedding into their pouches and ended up choking on it. Solution: use non-scented tissue paper. Tear it apart in small pieces. Food - Pellets or Lab block diets such as Kaytee Rainbow Exact are much healthier for your Hamster. You can add small amounts of seeds to their diet for treats. Fruit/Veggies - You can give your Hamster small amounts of fruits and vegetables on a daily basis. 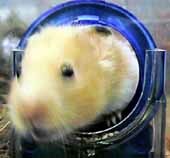 PLEASE NOTE: Syrian hamsters must be housed alone or they will fight, often to the death. What's involved in daily care of a hamster? Hamsters are relatively low maintenance animals. That does not mean they do not crave attention and need proper care. It's important to always have fresh food and water available. Make sure your hamster is living in a clean cage. Hamsters can be toilet trained. (Put a little plastic container in a corner of the cage and fill it with Carefresh) Cleaning cage weekly is recommended. Where do I find a hamster? Please check out your local Shelters first. Search for a hamster!